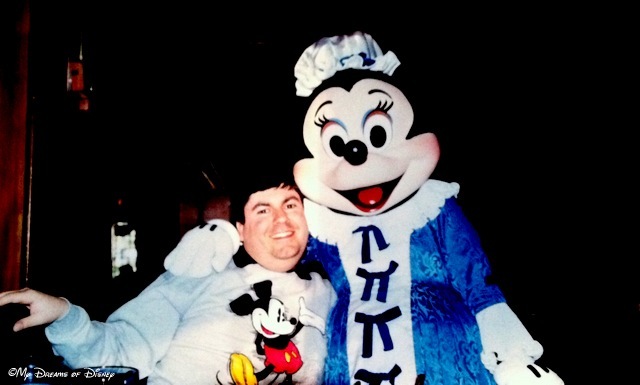 In this incriminating photo, my wife Cindy has proof of my infatuation with Minnie Mouse! Hello everyone, and welcome to this week’s edition of Our Favorite Disney Memories! Last week I shared with you our favorite Disney Memories that my wife and I had from our trip over July 3rd and 4th, 2000, just before we got married. Well, fast forward now to January, 2001 — when we were pregnant with our daughter Sophie, and took advantage of a long weekend to enjoy the trip where we ate our way around Disney! So sit back and enjoy our trip down memory lane as Cindy and I share with you our favorite Disney Memories from the year 2001! When I asked Cindy what her favorite Disney Memory was, she had no hesitation on her answer. Immediately after I asked her, she said ‘My favorite memory was when I got proof of your flirting with Minnie Mouse!’ Of course, she is referring to the image at the top of this post, which was taken at the Liberty Tree Tavern in Liberty Square at the Magic Kingdom. Back in those days it was a character restaurant, and I wish it still was! I loved seeing Minnie and the other characters in their period clothing selections, and of course, the food there is pretty dang good! I love my wife, and that was the perfect response. It was a great memory, and one that I won’t soon forget — especially since Sophie has already told us she wants to get married at Walt Disney World — this, despite not having a man picked out or anything like that. Those, evidently, are small details. My friends, thank you for taking time out of your day to stop by and visit! I hope you enjoy these looks at my favorite Disney Memories — now please, tell me, what is your favorite Disney memory? Please let me know, and let’s all make it a great Disney Day! What will be our next favorite Disney Memory? Monorail Facts that will Astound you!